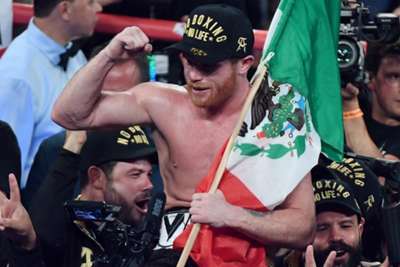 Saul 'Canelo' Alvarez admits he is taking a risk by leaving his comfort zone to step up to super middleweight to face Rocky Fielding, but he is ready to rise to the challenge. Two-weight world champion Canelo (50-1-2) announced a record-breaking 11-fight deal with DAZN on Wednesday - the richest contract in sporting history - and his first bout will come against 168-pound WBA king Fielding. The clash in New York City's Madison Square Garden on December 15 represents the Mexican's maiden venture into the super middleweight division, but he believes it is a crucial step in his career. "It's a challenge for me to be moving up a division. It's a challenge to be fighting for this world title," Canelo, who last September handed Gennady Golovkin his first defeat, told Omnisport. "But it's also important for me, it's important for my career, it's important for Mexico. "It's a risk, because I'm going into the comfort zone of the champion, but I'm ready to take on this challenge. I know it will be difficult but we're going to be ready for this. "There's a reason [Fielding] is champion. It will be a challenge to be moving up a division, to be having a fight in his way in the comfort zone of the champion. "I know that he comes forward. I know that he knows how to fight. But it's a big challenge that we're willing to take." Canelo is not looking too far ahead but seems unlikely to make super middleweight his permanent domain. "I want to win this title first and we will see what follows," he added. "I feel comfortable at 160 pounds so surely we will return there."